Over time arrogance will limit any leader. We have all seen it with folks in leadership positions. People simply will not follow such a person. Maybe years ago people did not have a choice and arrogance was commonplace for senior leadership. These days there is a different work contract. People expect more from their leaders. People have a say and arrogance is first of the list to go. Let me continue my baseball theme with this post and talk about how a baseball manager lost his job due to his arrogance. Moreover, how the team owner and other senior leaders proved that doubling down on arrogance is a sure guarantee of failure. The team is the Boston Red Sox and the fired manager is Bobby Valentine. For those who do not know, Bobby Valentine replaced a very popular manager, Terry Francona, who lead the Red Sox to their first World Series championships since the beginning of time. Last year the team lost its edge and the team showed little discipline on and off the field. Something needed to change and the decision by the owner was to fire the well-loved manager for a tough-minded manager with a goal to improve the discipline. How did that work out? The Red Sox team had their worst year in over 50 years and the new manager was fired only one year into the job. First Bobby Valentine in baseball circles is a known entity. He has managed before to some success. As I read, he is considered one of the smartest men in professional baseball. Yet he is arrogant and needlessly conflicted with his players and the media. Most likely his approach would have worked years ago in baseball. The players had no voice. Today ball players as well as employees nearly everywhere have a voice. Yea, nearly everywhere … this past week the Chinese workers making new iPhones pushed back against corporate arrogance and they demanded to be heard. The world of work and how we lead has changed forever. We need to banish arrogance altogether from leadership. Okay, back to baseball. 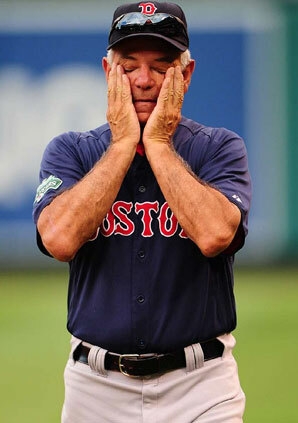 Bobby Valentine was fired this past week a day after the season ended for the Boston Red Sox. Last year the team owner and the team CEO reacted nearly as fast to fire the popular and overall successful manager, Terry Francona. The arrogance at the top of the organization far exceeds the day-to-day arrogance of the manager they decided to hire. Smart people make for bad leaders when arrogance supersedes rationality, recognition, and perspective. The senior leadership showed their own arrogance by over-reacting the previous year and firing the best manager they ever had on the job. The Forbes article nails it, stating that a better leadership course would have been to hold a meeting “to re-establish organizational expectations regarding behavior, conduct and ethos”. As leaders we need to learn from mistakes and times when success escapes us. As leaders we need to watch out for over-reaction. As leaders we need to keep our eyes open and keep a vigil against arrogance. Good post Michael. I’ve found that with arrogance often comes with an abusive manager…both are intolerable and unacceptable. Yes indeed David. We stand up against both arrogance and abusive behavior and point the way to effective behavior. Our Schedule from here on out is pathetically easy, but the hole is deep.How about a cnteost no prize, but bragging rights.Last week I pointed out that aron (giving it all he’s got) Miles had all of 26 hits this season. Well, the number has not changed. Our starting pitchers have 40. The question is How many hits will Miles end up with. Now if Lou is awake on any given day, aron will get zero more starts and zero more pinch hit tries. But we all know Lou will not be awake for the next 5 weeks, so any thing can happen. I’m gonna guess he gets 32. We can make that an over and under if you like, I’d go under if I had to choose.Any takers? I need the Cubs to invent a time macinhe and go back to a time when they can play and then beat a winning baseball team. As it stands right now, they could sweep all 10 home games against these crappy teams and it won’t mean a damn thing.They will gain (at most) four games in the standings, but still have the inability to play on the road or versus a team that is competent. They had the opportunity to make a statement in LA and they failed miserably.They are done.